It had been just under a year since my last visit to Unity so it was lovely to return. 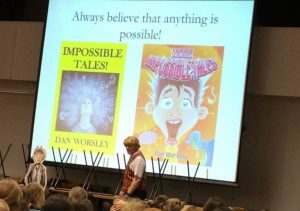 After squeezing nearly 400 pupils into the hall, I shared the latest instalment in my writing adventure. The children found out what Eric had been doing in his latest book and even got to see some of the illustrations in three earky stages of development. I blew their minds by showing the pupils all six of the manuscripts that were created during the editing and writing stages. 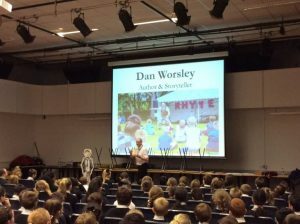 I couldn’t visit without sharing a Tale so I put on the storytelling waistcoat to perform ‘Keep Your Hair On’. The wig (see the picture below) steals the show and always gets a laugh! It was a top visit to Unity and a real pleasure to return later in the week to chat with the pupils again and sign some books. Big thanks to Mrs Latham for organising the session and promoting the signing.